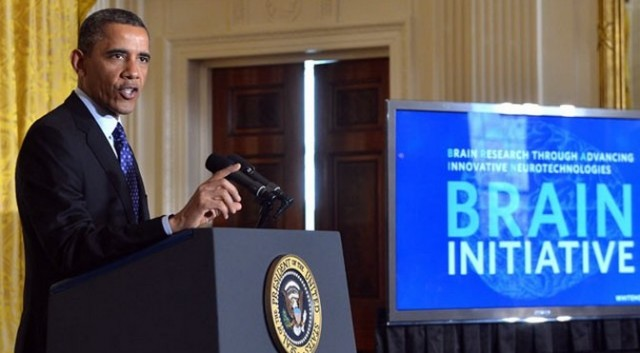 On April 2, 2013, at a White House event, President Barack Obama unveiled a bold new research initiative designed to revolutionize our understanding of the human mind and uncover new ways to treat, prevent, and cure brain disorders like Alzheimer’s, schizophrenia, autism, epilepsy, and traumatic brain injury. The Brain Research through Advancing Innovative Neurotechnologies (BRAIN) Initiative is one of the Administration’s Grand Challenges – ambitious but achievable goals that require advances in science and technology. It is built on strong public-private partnerships and convergent science, including collaborative work in neuroscience, agriculture, biology, chemistry, cognitive science, computer science, education, engineering, ethics, materials science, medicine, physics, psychology, and other areas. The BRAIN Initiative is a focused activity within a larger White House Neuroscience Initiative, which spans neuroscience and mental health-related activities directed by the White House, or supported by the White House Office of Science and Technology Policy (OSTP). It includes the activities of the NSTC Interagency Working Group on Neuroscience, The BRAIN Initiative, the National Alzheimer’s Project, and other programs. Its goals are being achieved through strategic opportunities, working across over 20 agencies and promoting collaboration between the government and the private sector. The initiative provides a broad and comprehensive approach to basic and applied neuroscience and behavior, and spans many areas, including neurodegenerative disease, brain injury, mental health, aging, emerging technology, and aspects of food and nutrition. This lecture will discuss precursors and catalysts to The BRAIN Initiative along with an update on the rapid growth of the initiative and possible future developments. It will also provide a glimpse of the role of OSTP in helping to coordinate such efforts related to federal science policy. Philip Rubin is a cognitive scientist, technologist, and science administrator who has long been involved in science advocacy, education, funding, and policy. He carries out highly interdisciplinary research that combines computational, engineering, linguistic, physiological, and psychological approaches to studying embodied cognition, particularly the biological bases of speech and language. He is particularly well known for his work on computational modeling of the physiology and acoustics of speech production, speech perception, sine wave synthesis, signal processing, perceptual organization, and theoretical approaches to and modeling of complex temporal events. Philip is Senior Advisor to the President and CEO Emeritus at Haskins Laboratories, a research institute affiliated with Yale University and the University of Connecticut focused primarily on the scientific study of speech, language, and reading. He is also an adjunct professor in the Department of Surgery, Otolaryngology, at the Yale University School of Medicine, a Research Affiliate in the Department of Psychology at Yale, and a Fellow at Yale’s Trumbull College. He recently retired from his position as Principal Assistant Director for Science in the White House Office of Science and Technology Policy (OSTP) in the Executive Office of the President of the United States. While there he served as Assistant Director for Social, Behavioral, and Economic Sciences and led the White House neuroscience initiative. He also served concurrently as Senior Advisor in the Social, Behavioral and Economic Sciences directorate at the National Science Foundation. He is the former Co-Chair of the National Science and Technology Council Committee on Science, served as the Director of the Division of Behavioral and Cognitive Sciences at the National Science Foundation, and Chair of the National Academies Board on Behavioral, Cognitive, and Sensory Sciences. He is a Fellow of the American Association for the Advancement of Science, the Acoustical Society of America, the American Psychological Association, the Association for Psychological Science, the Linguistic Society of America. 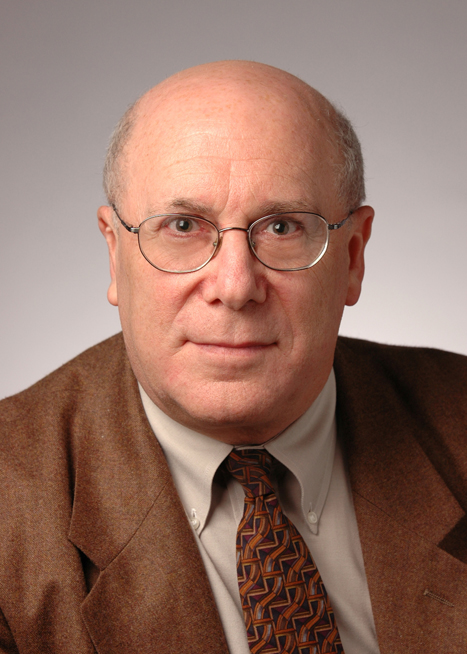 He is a Senior Member of the IEEE, a member of the Philosophical Society of Washington, and an elected member of the National Academy of Public Administration. Among other awards and honors, Phillip is the recipient of the American Psychological Association’s Meritorious Research Service Commendation. He received a BA from Brandeis University in Psychology and Linguistics and an MA and PhD from the University of Connecticut in experimental psychology. President Larry Millstein called the 2354th meeting of the Society to order at the Cosmos Club in Washington, D.C. on November 20, 2015 at 8:06 p.m. He announced the order of business and welcomed new members. The minutes of the previous meeting were read and approved. President Millstein then introduced the speaker for the evening, Philip Rubin, Senior Advisor to the President & CEO Emeritus, Haskins Laboratories; and Research Affiliate in Psychology and Adjunct Professor at the Yale University School of Medicine. His lecture was titled “Obama’s BRAIN: A View of Science Policy from Inside the White House”. Dr. Rubin began with the observation that even most Presidents and executive staffers are not aware of much of the “behind the scenes” work by scientists and other stakeholders that goes into producing scientific discoveries that make headlines. His talk was intended to provide a foundation for everyone who wishes to better understand how science policy is developed and implemented in the United States. His lens for the discussion was the BRAIN Initiative, an acronym for Brain Research through Advancing Innovative Neurotechnologies. The White House has many reasons to invest in neuroscience research, he said. Neurological disorders afflict more than 50 million Americans each year. In 2011, treatment due to such disorders cost more than 500 billion dollars. Treatment and care for Alzheimer’s patients costs 50 billion annually; strokes cost 54 billion annually. Traumatic Brain Injuries affect millions more, and are not yet well enough understood even to estimate their prevalence or cost. Dr. Rubin described the BRAIN Initiative is an “all hands on deck” effort to promote collaboration between government, private companies, health systems, and patient advocacy groups to work on these problems. The challenge that the BRAIN Initiative is intended to meet is the need for a revolutionary understanding of the brain in order to treat diseases that have previously been considered inevitable or terminal, including traumatic brain injuries, PTSD, Alzheimer’s, and Parkinson’s. The Initiative also includes an examination of the bioethical issues raised by such research. Dr. Rubin noted that the United States is different from other nations in not having a single, coordinated Ministry of Science. Instead, the U.S. government acts as a catalyst and communicator, attempting to facilitate coordination and ensure that scientific and technical achievements lead to benefits for society. Perhaps unsurprisingly, a great deal of the interconnection between various stakeholders in the government, academia, and private sector occurs through committees. Many such efforts are coordinated by the White House Office of Science and Technology Policy. OSTP’s mission is to provide the President with timely scientific and technical advice, to ensure that Executive Branch policies are informed by sound science, and to ensure that scientific and technical accomplishments are properly coordinated to benefit society. OSTP oversees two other key bodies. One is the National Science and Technology Council (NSTC), made up of several sectoral Committees, each of which coordinates the work of myriad Federal agencies in support of the President’s goals in such domains as environment, national security, technology, and STEM education. The other is the President’s Council of Advisors on Science and Technology (PCAST), an expert group that directly advises the president, making recommendations and helping guide Executive Branch policies. Dr. Rubin concluded his presentation by noting that breakthroughs in these complex areas rely on cross-disciplinary partnerships and convergent science, which is what these committees are designed to foster. After the conclusion of the talk, President Millstein invited questions from the audience. One audience member asked why the U.S. has not adopted a “Manhattan Project” style approach to solve one pressing problem in neuroscience. Dr. Rubin acknowledged the appeal, but noted that a centrally directed effort would risk losing much of the accidental yet revolutionary work achieved by self-directed researchers. Another questioner asked whether the pharmaceutical industry participated in the OSTP committees. Dr. Rubin replied that pharmaceutical research companies participate primarily through the National Academy of Medicine. After the question and answer period, President Millstein thanked the speaker, made the usual housekeeping announcements, and invited guests to join the Society. At 9:56 p.m., President Millstein adjourned the 2354th meeting of the Society to the social hour.